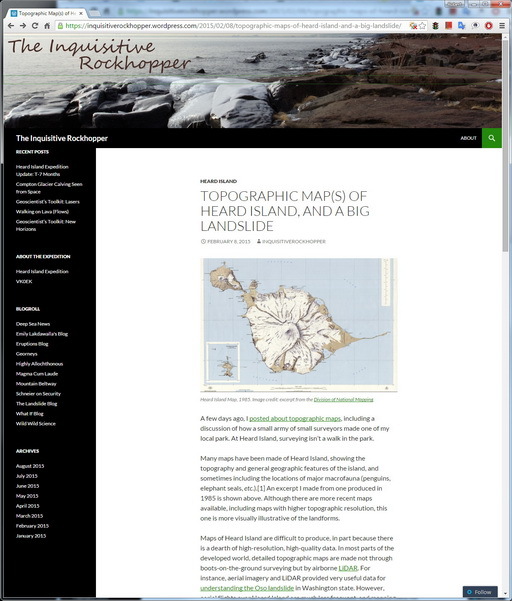 On this blog I intend to cover a review of the scientific knowledge so far acquired on or about Heard Island, what I hope to accomplish while I’m there, and what some of the challenges are associated with this expedition. I am also on Twitter as @i_rockhopper. Bill is doing more than presenting his activities: he’s actually making discoveries about Heard Island. For instance, in a detailed examination of recent satellite images, Bill found clear evidence for a major glacial calving event that dropped millions of tons of ice and snow into one of the largest lagoons (Compton Lagoon). The observation is indicative of the extreme dynamic nature of Heard Island: it changes constantly, hence continual observation is a crucial requirement for understanding the nature and evolution of this volcanic island and the plants and animals that live there. Check out Bill’s discovery of the calvinghere. ← Very Generous Donation from the Idaho DX Association!